The “demining mini-spade” is a small excavation tool designed to remove spoil loosened or to dig entire excavations in soft soils. The unconventional shape of the tool obliges a kneeling or squatting deminer to work with their hand at a low angle to the ground. 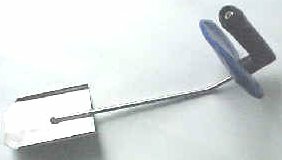 Made using a malleable stainless steel head andshaft, the tool is designed to flex when excess force is applied, so making it difficult to use for excavation of spoil that had not already been loosened – a process that would involve the risk of digging beneath a mine and detonating it with upward pressure. 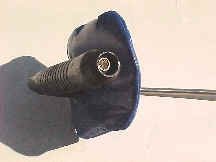 The spade-head is bent in the middle with a 1cm lip at the sides. This makes it efficient at shifting large quantities of loosened spoil with one hand. The shaft is 8mm stainless steel round-bar and keeps the user’s hand more than 37cm from the end of the head. The handle is made of non-shattering polyethylene which has performed excellently in all test and real blast situations. The user’s hand is protected by a small aramid hand-guard that is braced with a polycarbonate support that holds it upright in front of the hand. The tool weighs around 0.7Kg (1.5 lbs). In tests, the tool stayed in one piece even when a mine was placed on the spade-head and detonated. Contact us for more information quoting SKU number SKU3026.